Palais Maillot - the new hip place on the map of Paris nightlife. This prestigious club is ideally situated between the Champs Elysees and Neuilly, directly in the building of the Palais des Congres in Paris.Since its opening Palais Maillot has become "a home" for a large number of celebrities. It regularly performs Britney Spears, Usher, puppet group Pussycat Dolls, Neyo, Lil Kim, Timbaland and many others. The decor of the club is Baroque. Institution works on Thursday from 7 pm until the morning. On Friday and Saturday - from 11 pm to 5 am. Located in the 17th Arrondissement of Paris, Le Palais Maillot Club Paris carves a name for itself in the Parisian clubbing scene. The club's contemporary design and stylish decoration create a chic atmosphere for its guests, who are welcome every Thursday evening from 7 p.m. onwards for a sumptuous buffet dinner and drinks after work. 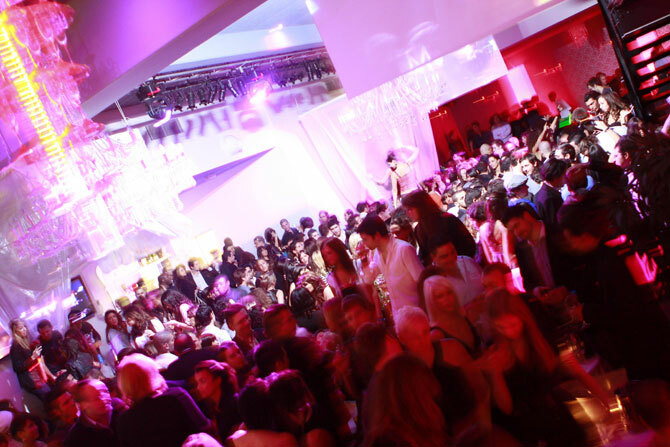 The place turns into an immense dancefloor every Friday and Saturday evenings for two nights of dancing and fun amongst friends.Le Palais Maillot Club Paris is also ideally situated close to the Palais des Congrés in Paris, making it a suitable choice for private organized events such as press conferences, seminars, dinner galas and cocktail receptions. Its four spaces include the VIP lounge, the Grand Room, Salon Louis Philippe and the Mezzanine, all of which can cater for up to 1,500 guests for a huge dancing party. Reserve your stay at a hotel nearby and enjoy your evenings at Le Palais Maillot Club Paris.